Basic Post: Free up space on your iPad and iPhone! With all the apps that I download on my iPad on iPhone, I am finding myself constantly worrying about running out of storage. I have a 16gb iPad2. When I bought my iPhone5, I thought I would avoid this problem by jumping up to a 32gb version, but lately I have been running out of space on it as well. iOS6 takes up a huge portion of the devices. I know people with 8gb iPhones, and I have no idea how they can properly use them! 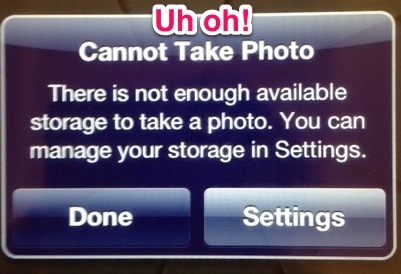 Between iOS6, music and photos, there is essentially no extra storage for quality apps. Remember that having a 32GB iPad does not mean you truly have 32GB of storage. In order to figure out how to see what you can do to save some storage, go to “Settings”, “General”, then find “Usage”. It will take a few moments, but a list of all the apps that you have will appear, beginning with the largest culprits of storage hogs. If you see an app that you no longer use, or could live without, delete it. Remember, if it’s a paid app, you can download it again later for no additional charge. Even if an app only takes up 40MB, delete it if you don’t use it. For myself, I keep an ever-growing list of apps that I delete, just in case I want to re-install it one day. Apps like GarageBand and Keynote/Pages are huge storage hogs, taking up to 1GB each! A lot of the time, you will find that your photos and videos take up the most space. 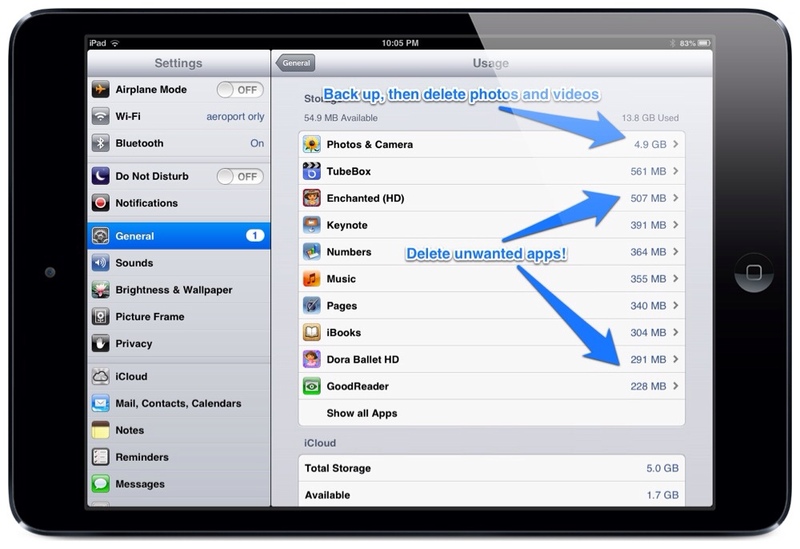 Free up space by saving using Camera Upload on Dropbox or a service like Smugmug, then delete them off your iDevice. Delete your longest videos first, since they take up the most space. Definitely delete photos and videos that are not good and worth keeping at all. Bonus! If you subscribe to iTunes Match, a quick and easy way to free up a large amount of space is to completely delete all your music. Don’t worry, since your mp3s are all saved in the cloud, you don’t actually lose anything. You can individually download each song/playlist as you need it in the future. This would be the easiest way to increase your storage, especially if you don’t have time to do steps 1 and 2 if you’re on the road and need that extra space to take photos and videos. My next devices, needless to say, will be larger capacity ones. My next iPad will be at least 32GB, and iPhone will be 64GB. The extra storage, in my opinion, is worth every cent. Do you have any other quick tips for readers for this topic? Please kindly share in the comments! Thanks for the useful tips, Steve. I didn’t know that I could delete an app and re-install it later. Cool! Pas de problème! Thanks for sharing! That IS cool! And VERY good to know! Thanks Audrey! Are you in charge of Appy family? Finally a clear and concise instruction on managing storage. My main question was that even though I was uploading pics to my 100 Gig storage if it would delete it when I deleted it off my iPad, like syncing so to speak…didn’t want to chance it. So bye bye pics…wow that will free up 2.5 gig fast!